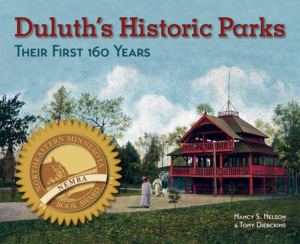 During the 1960s, Hartley Park became home to Duluth’s Soap Box Derby track. The derby, a national event that challenged young boys to design and build a motorless race car propelled only by gravity, had originated in Ohio in 1934. The boys, between the ages of eleven and fifteen, were required to build their own cars and could spend no more than ten dollars above the cost of wheels and axles. Duluth’s first All-American Soap Box Derby, described as a “coaster wagon race for boys,” took place in July 1947 at Lemon Drop Hill, a portion of London Road between Twenty-sixth and Thirtieth Avenues East where the Lemon Drop restaurant was located. Sponsors included the Junior Chamber of Commerce (Jaycees), the Duluth News Tribune and Duluth Herald, and local Chevrolet dealers. A crowd of about 10,000 spectators watched Duluth’s first race. The winner, fourteen-year-old Don Schafer, was flown to Akron, Ohio, to participate in the All-American Soap Box Derby. Unfortunately, he did not win the national derby. The high point for the Soap Box Derby in Duluth came in 1963. With a crowd of 1,500 spectators watching intently, twelve-year-old Harold “Bo” Conrad reached a speed of thirty miles an hour to beat a field of thirty-three other boys from the region. His final opponent, Steve Ingle of Hoyt Lakes, Minnesota, finished just a half length behind. It was a tough loss for Ingle, who had crashed twice already that day. Five other drivers lost control of their vehicles as well, including Duluth’s Keith Larivy, who ended up in the hospital with head injuries suffered when he went off the track and into the crowd. Like Schafer sixteen years earlier, Conrad went on to the national championship in Akron. This time, Duluth’s hometown champion won the race. The News Tribune reported that in Akron 75,000 people watched Conrad—at forty miles per hour—win by just four inches. He returned to Duluth All-American Soap Box Derby Champion and was greeted with a Superior Street parade. Duluth’s final Soap Box Derby race took place in 1968. Plans were underway for the 1969 race, but it was canceled due to lack of interest and organizational problems. Hartley Park’s days as home of the Soap Box Derby have not been forgotten. Derby Downs racer Dale Mell—who represented Duluth in Akron in 1964—donated his car to the Hartley Nature Center, where it is on display today. Dale is shown in the photos winning the final race of the 1964 Duluth derby and talking with his father before the race. And the asphalt remains of Duluth’s Derby Downs track, now overgrown with vegetation, can still be found near the nature center.